Oops - we don't appear to have a video for the GT-2500 Plus. To be honest with you, it’s an amazing product and we like it. It has really increased the efficient of our office administrator’s work. It’s so faster than we expected. Now, your workgroup can take advantage of high-speed document imaging without breaking the bottom line. The fast, affordable Epson. GT-2500 Plus delivers remarkable scans up to 8.5" x 14", plus networking capabilities for small business environments. Best of all, the GT-2500 Plus consistently delivers vivid colors and crisp, sharp text thanks to 1200 dpi high resolution scanning, plus 48-bit color. With this versatile performer, you get everything you need for brilliant document imaging. Choose the Epson GT-2500 Plus, and utilize additional features your workgroup's sure to appreciate. Take advantage of productivity software, plus an included network card. With the GT-2500 Plus, each member of your team can access high performance scanning for critical project needs. 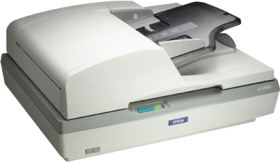 The Epson GT-2500 Plus presents a remarkable solution for affordable document imaging. And, with its convenient compact design, it is the perfect fit for any office environment.